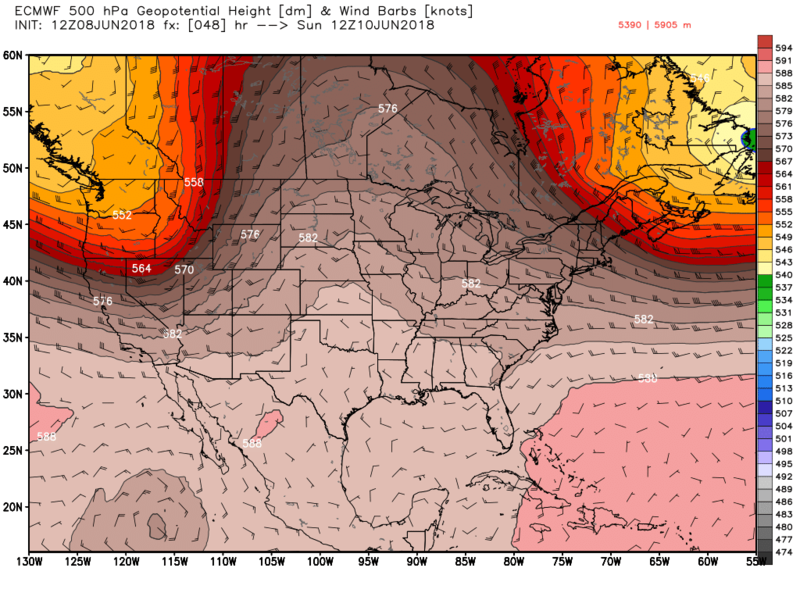 Big omega block over the mid CONUS extending into central Canada. With all that confluence over the N Mid Atlantic and NE if this were winter this would result in suppression depression and we would watch the mid Atlantic enjoy all the snow, but since its the late spring the big HP to the north suppresses the precip to the south (C NJ on southward), and we get to enjoy some nice but cool, relative to the time of year, weather and the weekend should be pretty nice for the NYC metro area. There still may be a stray shower Late Sat into Early Sunday though....enjoy! This certainly has been nice for June. The air conditioning is off, saving money, the pool is around 75 and warm enough to enjoy, and the peepers are serenading. The firewood is cut, stacked, and ready for the coming of the fall in 106 days and 196 days until the first day of winter. I am happy but my son is not for he has to cut the grass which is growing robustly. I will probably start a holy war for saying this, but I could take this weather all summer. dkodgis wrote: This certainly has been nice for June. The air conditioning is off, saving money, the pool is around 75 and warm enough to enjoy, and the peepers are serenading. The firewood is cut, stacked, and ready for the coming of the fall in 106 days and 196 days until the first day of winter. I am happy but my son is not for he has to cut the grass which is growing robustly. I will probably start a holy war for saying this, but I could take this weather all summer. nope not from me...I do not need to have 90 degree weather to enjoy summer...just warm enough to swim, cool nights for a sweatshirt to watch the lightning bugs or the stars..as far as ac...I am so envious of you!!! can't open windows in our house because of allergies...have to wait to dead of winter when snow on the ground..to let in the fresh air...lol... ps...grass is growing like crazy this year..almost could cut 2 x per week right now... enjoy!! It is statistically insignificant but also statistically significant enough to warrant. Keep an eye on the SE coast/NE GOM for possible development in the 5-10day time frame. As JB says...ridge over troubled waters. This is not the same convection that was noted above. MJO possibly headed into phase 2 which would def support this if it gets into 2.
sroc4 wrote: Keep an eye on the SE coast/NE GOM for possible development in the 5-10day time frame. 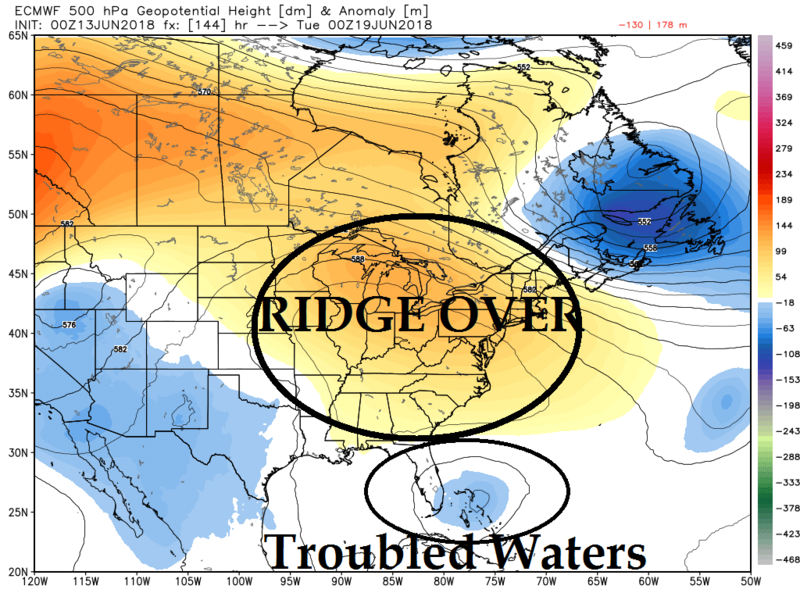 As JB says...ridge over troubled waters. This is not the same convection that was noted above. MJO possibly headed into phase 2 which would def support this if it gets into 2. 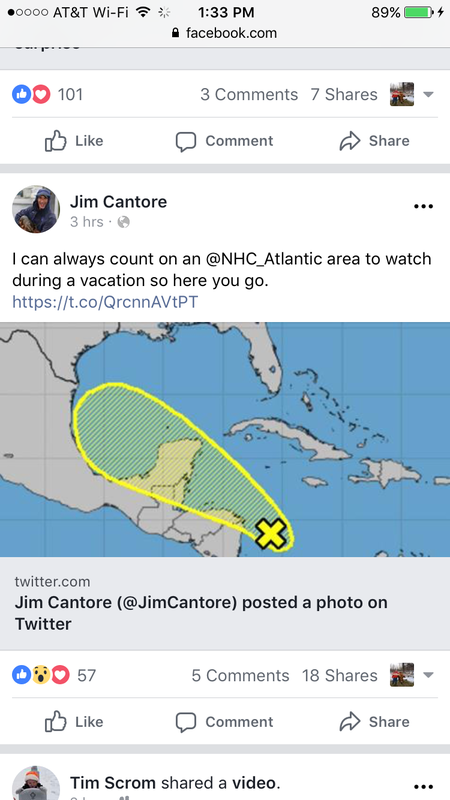 Not sure of the impacts, if any, for our region. Too early to tell. sroc4 wrote: Not sure of the impacts, if any, for our region. Too early to tell. Thank you...lots of out door activities at school coming...and our boat trip..but that starts on the 30th...have a great day...its ABSOLUTELY BEAUTIFUL TODAY!!! But the wind was kicking, deck furniture tossed around, deck plants tipped over, some cracked limbs off of trees. Weather station says gusts of 36 mph. Nice day but windier than what I expected. I was sitting under a graduation tent and giving it the evil eye as the wind really moved the top around, I had my exit planned just in case. dkodgis wrote: But the wind was kicking, deck furniture tossed around, deck plants tipped over, some cracked limbs off of trees. Weather station says gusts of 36 mph. Nice day but windier than what I expected. I was sitting under a graduation tent and giving it the evil eye as the wind really move the top around, I had my exit planned just in case. Same here, very windy.Not used to that in these late Spring days, this is a winter thing after a snowstorm hits and passes N and E.Looks like we finally get the heat next week, right on target for the beginning of summer. Gonna try to make this a normal, weekly event if I can They won't be as in depth as I usually go for the board, but I'm doing them for a different audience so I kind of can't haha That said, I think these will suffice for now........unless, of course, you want me to post separate videos lol Then I can go as technical as you like aha let me know!! But for future reference, I will be trying to trim these down to more in the 5-10 minute range, if possible, and only explain what I need to for the average person to be able understand. Anyway, I hope you enjoy it, and as usual, any questions, comments, concerns, etc. are welcome!! I see the heat is coming, Monday especially, and then a step back a bit in temps. I can't help but try to add 2+2=5 here. When it is a somewhat cool June, July will get hotter but not as much as we'd expect, and El Nino is coming? Drought in the south (http://droughtmonitor.unl.edu/CurrentMap/StateDroughtMonitor.aspx?South)? Heat wave in the southwest? I think I 've seen the movie. Forgot to say while everyone else is getting torched with high temps, here in our neck of the woods we are seeing cooler temps. It seems everyone everywhere is experiencing the "same" weather, longer. Another sign of anthropogenic climate change? It is as if weather patterns were working on musician-people's time. Come late, stay long, leave late. I think CP and Doc are behind it all. dkodgis wrote: Forgot to say while everyone else is getting torched with high temps, here in our neck of the woods we are seeing cooler temps. It seems everyone everywhere is experiencing the "same" weather, longer. Another sign of anthropogenic climate change? It is as if weather patterns were working on musician-people's time. Come late, stay long, leave late. I think CP and Doc are behind it all. LOL, Damian, CP working 24/7 in his Laboratory to make sure the Hudson Valley stays cold! Sure is a cool day today here, partly cloudy, breezy.You could use a light jacket! Can't answer about the climate change..but hope the weather stays cooler...we are coming to your neck of the woods this year for vacation...Boating up the Hudson for 2.5 weeks....so let it stay cool please! 91* but humidity is 35%...Happy Father's Day! 88° here and 31% humidity, just wait til tomorrow! Happy Father's Day to all the Dads on the board! Great day and Happy Dads day all dad's. Tomorrow will be absolutely disgusting. 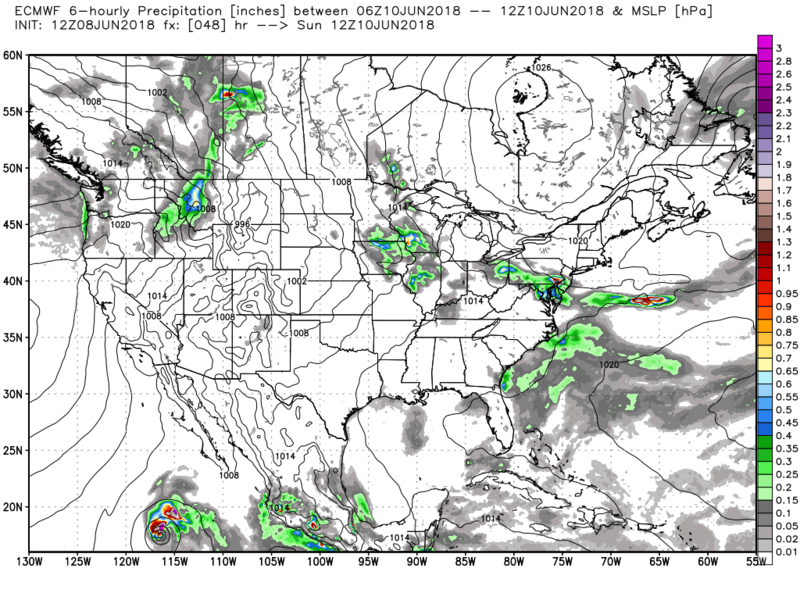 Looks to tamper down and then rebuild last week of June through July 4th week from the looks of the pattern. Modoki El Nino forecasts ramping up plus GOA warm blob with low solar and Negative QBO equals a very interesting winter pattern at this time. Geomagnetic earth effects are ramping up as well volcanic eruptions and earthquakes as well. Don't be surprised to see this norm as we move forward. Hit 93° here, not looking like I'll get any storms here, they're heading north into Hudson Valley and SWNJ. Severe T’Storm ripping through Somerville right now. Heavy rain, frequent lightning, strong wind gusts.